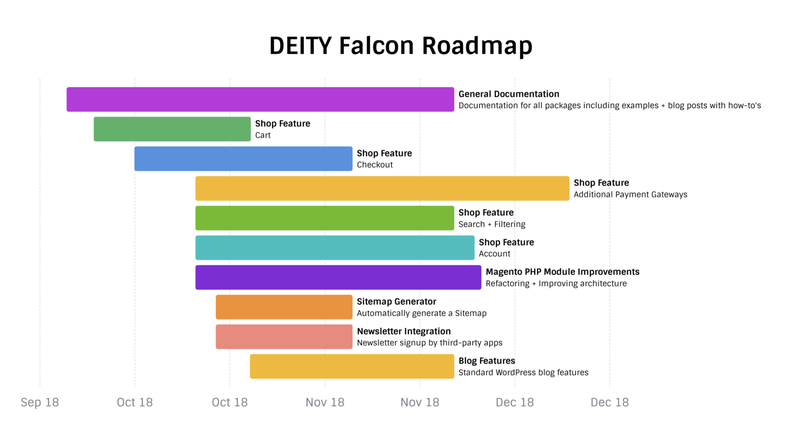 After the successful launch of DEITY Falcon open source, our team has been busy checking pull request, answering questions and helping developers who are taking the first steps to dive into our world. As promised, we started to plan our next steps, of which extending the Shop Features components are very high on our priority list. These features are carefully selected and prioritised, based on both market and community feedback — and what we think should be the basics of an e-commerce site. As you can see on the overview, in the coming month we will be working on Cart, Checkout, Account, Additional Payment Gateways and we will introduce native Search & Filtering. Additionally, we will be working on the improvement of the Magento PHP module, and for marketing purposes we will add Blog Features (based on WordPress), a newsletter integration and an automatic Sitemap integration. Depending on their releases, we will add a full GraphQL integration with Magento 2.3 and WordPress. Then a bit more long term, we plan a migration to TypeScript for Falcon Development. One of the most important things is that we will improve our general documentation for all packages including examples ánd we will be blogging some how-to’s soon — to help you get started your own project. So yes, there is a lot of things to do and we feel the urgency of merchants wanting to move to PWA… But the good thing is that we are not alone! To build these cool features faster, better and even more cool, we would love to work together with you. We embrace any contribution made by the community to help us deliver a better experience in the e-commerce world, for both users ánd developers. Would you like to become a contributor to the DEITY Falcon project, work with our core team and help us bring this project to the next level? Please reach out!